GESIS - The Leibniz Institute for the Social Sciences - is the largest German facility focusing on social sciences. With staff numbering over 200 at three sites (Mannheim, Cologne and Berlin), GESIS offers fundamental research and consulting services of interregional and international significance covering all levels of the scientific process. The services offered by GESIS follow a research data cycle. This begins with the research of the data and information, continues on to study planning and empirical data collection, progresses to the analysis of these data and, finally, concludes with the processing, registering, archiving and dissemination of the research data. In all these phases, as well as conducting research GESIS also seeks to transfer knowledge, and helps users to conduct research projects either individually or jointly with the institute. 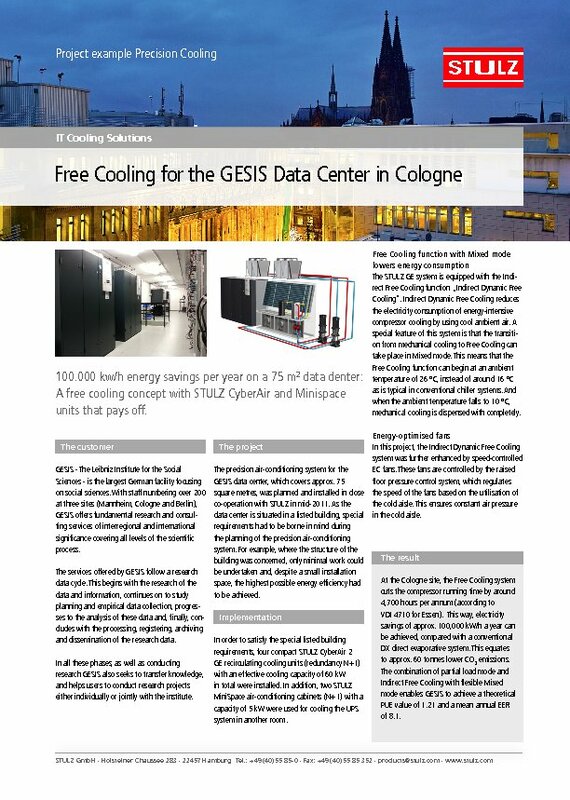 The precision air-conditioning system for the GESIS data center, which covers approx. 75 m², was planned and installed in close co-operation with STULZ in mid-2011. As the data center is situated in a listed building, special requirements had to be borne in mind during the planning of the precision air-conditioning system. For example, where the structure of the building was concerned, only minimal work could be undertaken and, despite a small installation space, the highest possible energy efficiency had to be achieved. In order to satisfy the special listed building requirements, four compact STULZ CyberAir 2 GE recirculating cooling units (redundancy N+1) with an effective cooling capacity of 60 kW in total were installed. In addition, two STULZ MiniSpace air-conditioning cabinets (N+1) with a capacity of 5 kW were used for cooling the UPS system in another room. The STULZ GE system is equipped with the Indirect Free Cooling function "Indirect Dynamic Free Cooling". Indirect Dynamic Free Cooling reduces the electricity consumption of energy-intensive compressor cooling by using cool ambient air. A special feature of this system is that the transition from mechanical cooling to Free Cooling can take place in Mixed mode. This means that the Free Cooling function can begin at an ambient temperature of 26 °C, instead of around 16 °C as is typical in conventional chiller systems. And when the ambient temperature falls to 10 °C, mechanical cooling is dispensed with completely. In this project, the Indirect Dynamic Free Cooling system was further enhanced by speed-controlled EC fans. These fans are controlled by the raised floor pressure control system, which regulates the speed of the fans based on the utilisation of the cold aisle. This ensures constant air pressure in the cold aisle. PUE value of 1.21 and a mean annual EER of 8.1.